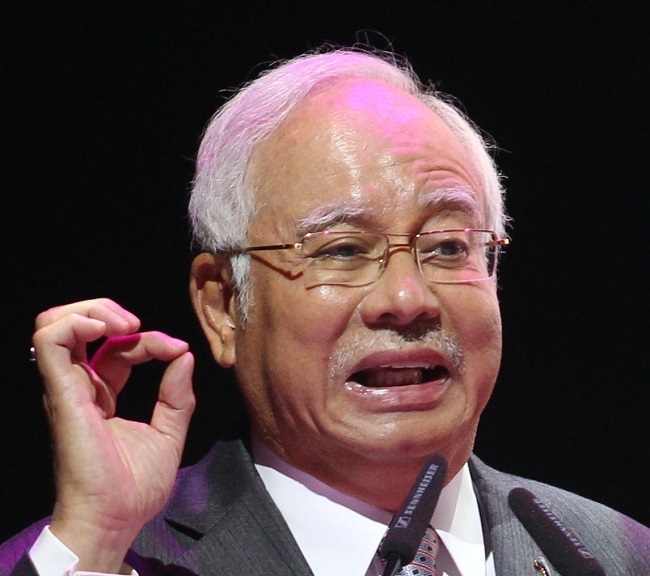 PUTRAJAYA (Feb 8): Former Prime Minister Datuk Seri Najib Tun Razak (pictured) has filed an appeal to quash a High Court ruling granting the public prosecutor to withdraw a certificate to transfer his seven charges over SRC International funds amounting to RM42 million from the Sessions Court to the High Court. Najib’s lawyer Tan Sri Muhammad Shafee Abdullah said the defence had filed a notice of appeal yesterday afternoon together with the certificate of urgency. “We will also file an appeal against the High Court’s decision in rejecting our application for a stay of the trial on Monday. We have asked for a stay, we have exhausted that, we have made the application before the High Court Judge, but the stay was not granted,” he said. The trial before High Court Judge Mohd Nazlan Mohd Ghazali is scheduled to commence on Tuesday (Feb 12). Muhammad Shafee said this before Court of Appeal Judges Datuk Kamardin Hashim, Datuk Harmindar Singh Dhaliwal and Datuk Mohamad Zabidin Mohd Diah when the case was heard before the three-man panel. Yesterday the panel was scheduled to hear three appeals by Najib on his application for a gag order to prohibit the media from discussing merits of his criminal cases; his application for discovery of documents and statements; and his challenge on the appointment of lawyer Datuk Sulaiman Abdullah as the lead prosecutor in his criminal breach of trust, power abuse and money laundering cases. All three applications were dismissed by Justice Mohd Nazlan. Earlier yesterday, Mohd Nazlan allowed an application by Attorney-General Tommy Thomas to withdraw the certificate to transfer the seven cases from the Sessions Court to the High Court based on the Federal Court decisions in Semenyih Jaya (2017) and M. Indira Gandhi (2018) cases, which caused doubts to arise in respect of the exercise of the powers by the Public Prosecutor to transfer a case from the Sessions Court to the High Court. Earlier, Muhammad Shafee had told the panel that the High Court decision in allowing the prosecution’s application to withdraw the certificate would nullify the entire proceedings of the case. “The entire proceedings is questionable,” he said, adding that the court should have heard the appeal on certificate of transfer first before hearing the three appeals. Thomas countered that yesterday’s appeals were related to the three appeals and had nothing to do with the appeal on the certificate of transfer. “Today’s appeals have nothing to do with this morning’s decision. The proceedings in the High Court from July last year until today is valid. Any ruling has prospective effect, it does not have retrospective effect,” he said adding that by doing this, the defence merely wanted to adjourn the trial.